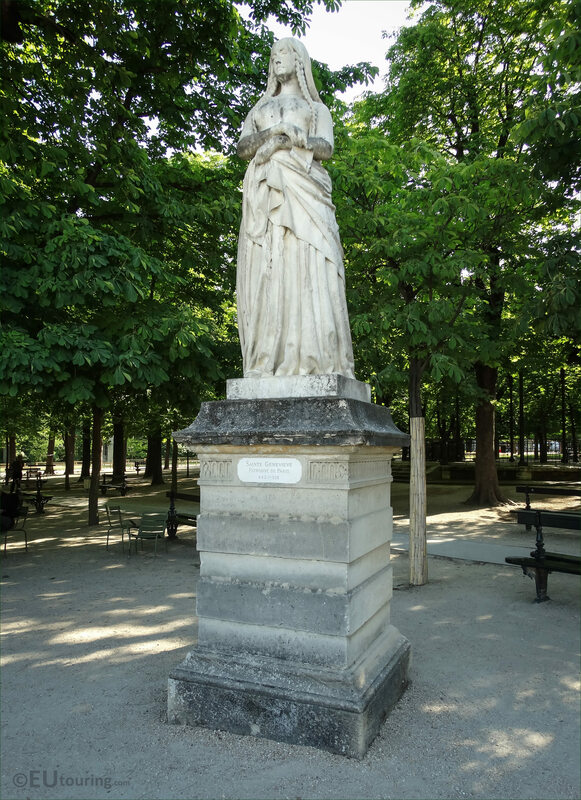 This time while we were within the Jardin du Luxembourg when we took these high definition photos showing the statue of Sainte Genevieve, the Patron Saint of Paris, that was sculpted by Michel Mercier. 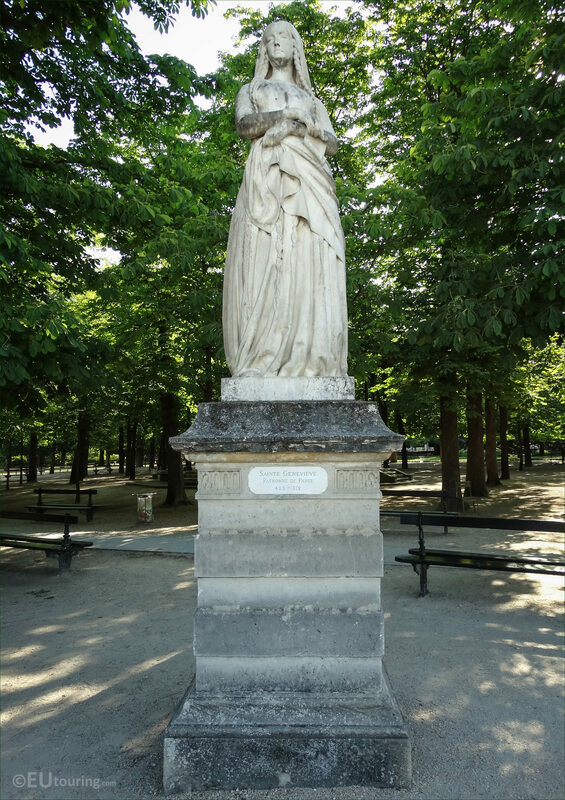 This first HD photo shows a marble statue of Sainte Genevieve, which is one of the series called Reines de France et Femmes Illustres that translates in English to Queens of France and Famous Women, and these were chosen by King Louis Philippe I to be placed on the terraces of the Luxembourg Gardens. And standing at a height of 2.4 metres on a stone pedestal base, this marble statue was commissioned to the artist Michel Louis Victor Mercier for the sum of 12,000 French Francs, which was by virtue of a ministerial decision dated 25th January 1843, yet the statue was not completed until 4th January 1845. 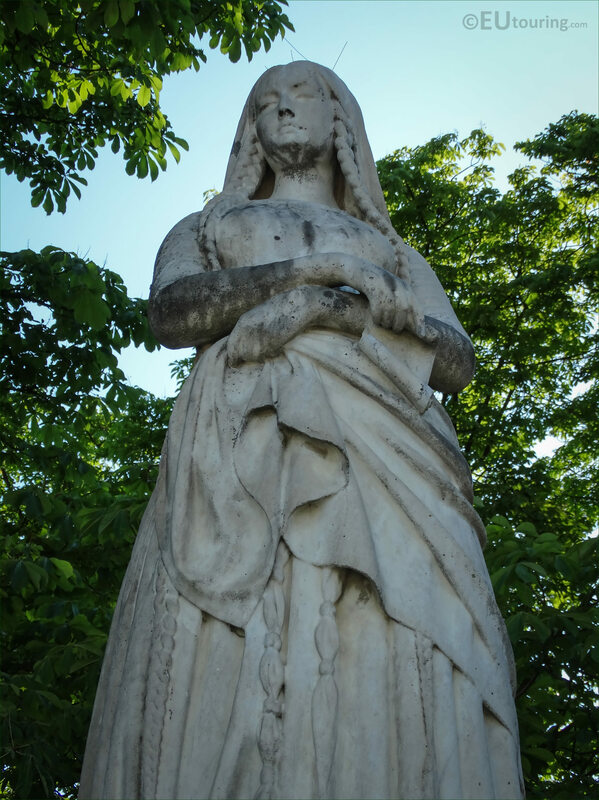 Now this next high definition photo shows a close up of the plaque located on the base of the statue, and as you can see it provides the name and the fact that she is the Patron of Paris. It also has the dates of 423 - 512, which is meant to be the dates of birth and death for Saint Genevieve, however, numerous sources all state different dates such as 419 or 422 and 502, as there are no precise records having ever been found. 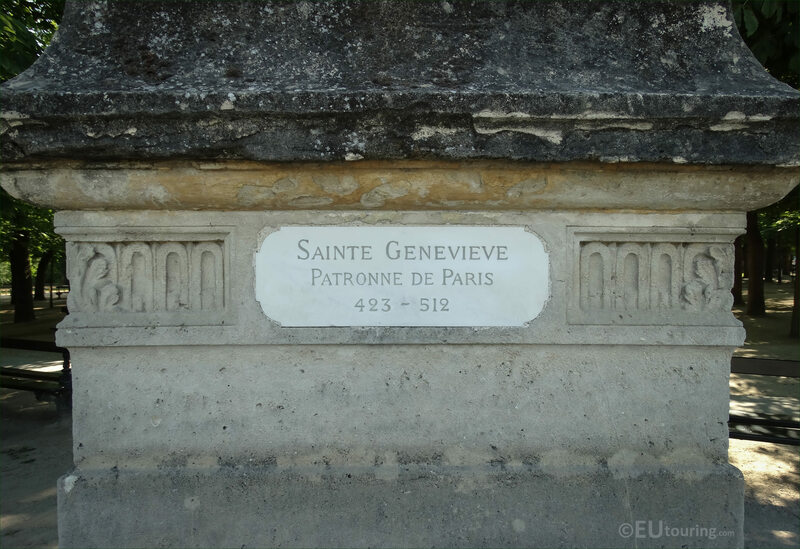 Genevieve was born in Nanterre and after an encounter with St Germain of Auxerre who foretold her future and that of being holy, she then got consecrated to God by the holy Bishop and when her parents died she went to live in Paris, which at the time was a city called Lutetia. Genevieve was also always about charity and the people, although much of her time was spent praying, and managing to bring grain to the city when there was a blockade on the city in 464 she had influence on Childreic, but also Clovis I who founded an abbey where she could minister. And upon her death she was entombed at the abbey and canonised to be Saint Genevieve, but also the Patron Saint of Paris, and the official feast day for Saint Genevieve is the 3rd January each year, yet today the tomb of Sainte Genevieve is to be found in the Saint-Étienne-du-Mont Church in Paris on the site of the former abbey, close to The Pantheon. 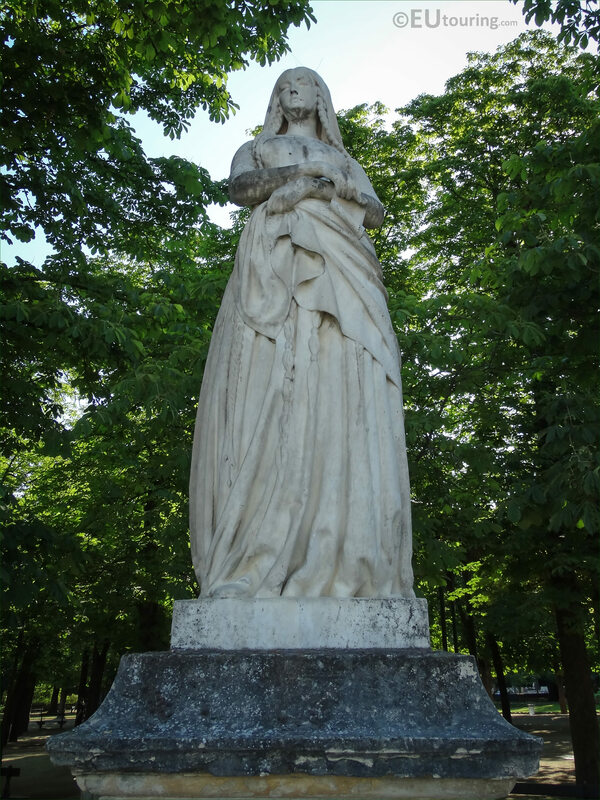 Now this last image shows another angle of the marble statue of Saint Genevieve, the Patron Saint of Paris, who is always depicted wearing a long flowing gown along with a mantle, or sleeveless cloak type garment going over the shoulders, and this is exactly how the artist Michel Louis Victor Mercier depicted this famous French woman. But to give you a quick few details on Michel Marcier, he was born in 1810 within Yvelines and became a French sculptor, mainly known for his busts of famous people, royalty and aristocrats, yet this is one of his more well known works, which he completed in 1845. 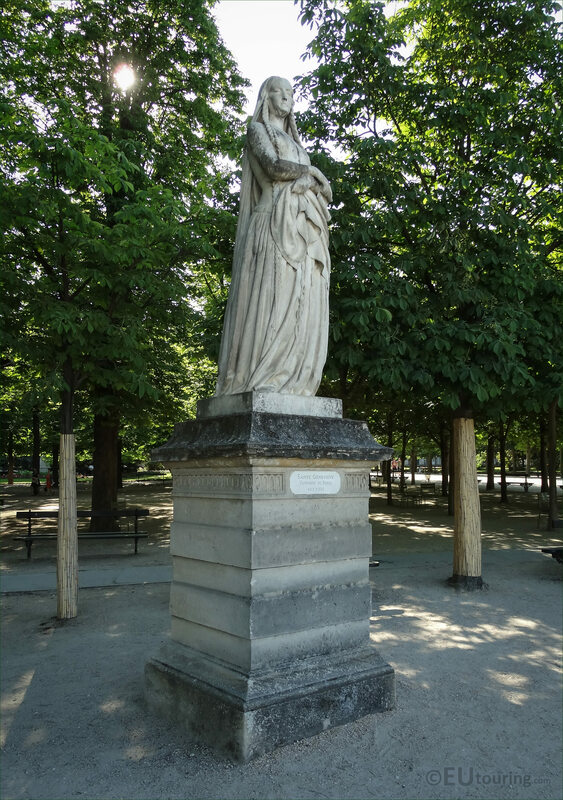 And this marble statue of Saint Genevieve is situated on the terrace surrounding the large pond within the Luxembourg gardens and is located to the east, or the right hand side, as if you are looking towards the Palais du Luxembourg for the garden.